These versatile muffins, made with a combination of almond and coconut flour, are lovely and light. They’re perfect for breakfast-on-the-run, a healthy snack at work or an afternoon pick-me-up with a lovely brew. 1. Preheat the oven to 180°C/gas mark 4. Line 8 holes of a 12-hole muffin tin with paper cases or wrappers. 2. Place 100g pistachios in a food-processor or a high-speed blender and process until very fine. Place the nuts into a large bowl and stir in the almond flour, coconut flour, sugar, baking powder, salt, orange zest and poppy seeds. 3. Squeeze the juice of the orange into a measuring jug, then add the almond milk to make up to 175ml. Pour over the dry ingredients and add the beaten eggs, almond oil and vanilla bean paste or extract (or put all the ingredients into an electric mixer). Process or stir until smooth and combined. 4. Spoon the mixture into the cases and top each one with the remaining poppy seeds and chopped pistachios. Bake for 25–30 minutes or until golden, cooked through and firm to the touch. 5. Leave the muffins to cool slightly in the tin for 5 minutes before transferring out onto a wire rack to cool completely. Place 500g of almonds (preferably blanched) in a high-speed blender or food-processor and pulse until they are as finely ground as you like, scraping the sides of the bowl with a flatbladed knife from time to time. This shouldn’t take more than about 10–20 seconds: if you process them for much longer they will turn into butter. To help avoid this, make sure that the processor bowl and blade are dry and cool and the nuts are at room temperature. 1. Place the nuts in a large bowl, cover with water and leave to soak for 4–6 hours, or preferably overnight. (Soaking aids the body’s ability to absorb nutrients, making the nuts more beneficial, nutritious and easily digested; almonds and hazelnuts need a couple of hours more; hemp seeds do not require soaking). 2. Drain the nuts or seeds, rinse under cold water and put into a high-speed blender or food-processor. Add the remaining ingredients with 1 litre of cold water and process until smooth. 3. Taste and adjust the sweetness and spices to your liking, adding more if necessary. 4. Strain the milk through a fine cloth or fine mesh sieve into a large bowl. Discard the solids. Stored in the fridge in a covered jug or lidded glass bottle it will keep for 3–4 days. 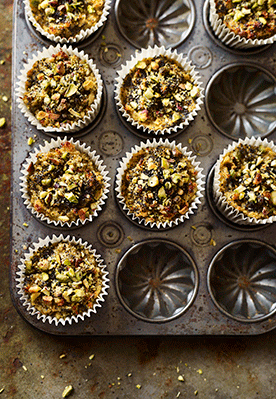 Recipes extracted from The Goodness of Nuts and Seeds by Natalie Seldon. Now available in all good bookshops (£9.99, Kyle Books).